VITA LEMON contains natural lemon juice, which is rich in vitamin C and in lemon acid. 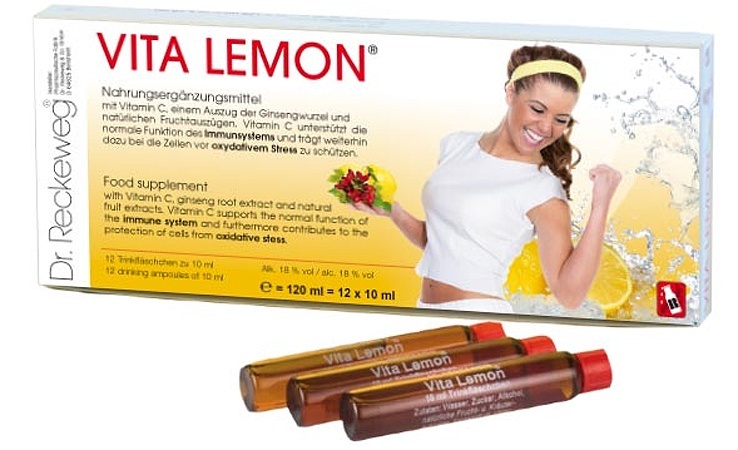 VITA LEMON also contains the fruit extract of the mountain ash berry, which is valued for its high content of Vitamin C and sorbose. The sorbose is an element of vitamin C and can, when needed by the body, be converted into active vitamin C.
Moreover, VITA LEMON contains the valuable elements of the hip, including a large proportion of vitamin C, vitamin B1 and B2, as well as Nicotinamid, which functions in the body as an essential of the metabolic enzyme. The B-group vitamins play a major role in regulated metabolic activity for all body cells. A lack of vitamin B (Thiamin) can, for example, manifest itself in nervousness and poor concentration! Vitamin B2 (Riboflavin) is an indispensable component of the flavin enzymes, which are vital for the production of energy in the body. Vitamin C is needed by the organism in large quantities. It not only strengthens the body's own defences against infectious diseases but also may help with stress. The intensive regenerative effect of VITA LEMON is essentially due to its high content of the Ginseng herb. Its effectiveness can be traced back to the valuable mineral content , such as the high proportion of vitamins B1 and B2, and it may be of benefit in cases of stress and low energy.